We are excited about the amazing opportunities for the youth of Gary that are evolving as a result of the new look Gary Youth Services Bureau. 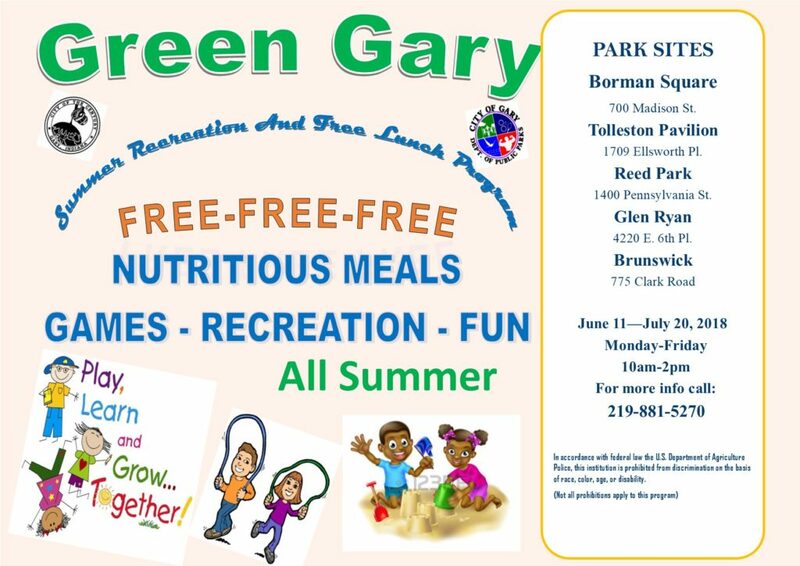 summer food service and recreation program. To date we have served over 7800 meals and are well on our way to serving over 20,000 meals to children this summer. Our summer program provides recreation, nutritious meals and snacks to children, 18 years and under, in low-income areas during the summer school vacation. This program is absolutely free. This is just the beginning of much more to come. Our newly defined mission is to equip youth with the tools to maximize their life’s potential, empower them to lead and give them a platform to make an impact in their city and the world. Our vision is to be a national leader in creating and sustaining youth programming that results in positive outcomes for youth. The Gary Youth Services Bureau and the City of Gary is currently looking for youth grades -12, that are interested serving on the City’s Youth Council. Please contact our office for more information and/or an application. Check out what GYSB’s Environmental Summit! For more information on the new and improved Youth Services Bureau, download the brochure here.